Despite being £300 cheaper than Sonos’s other TV audio solutions, the Beam is expensive for just a soundbar. The thing is, it isn’t just a soundbar. 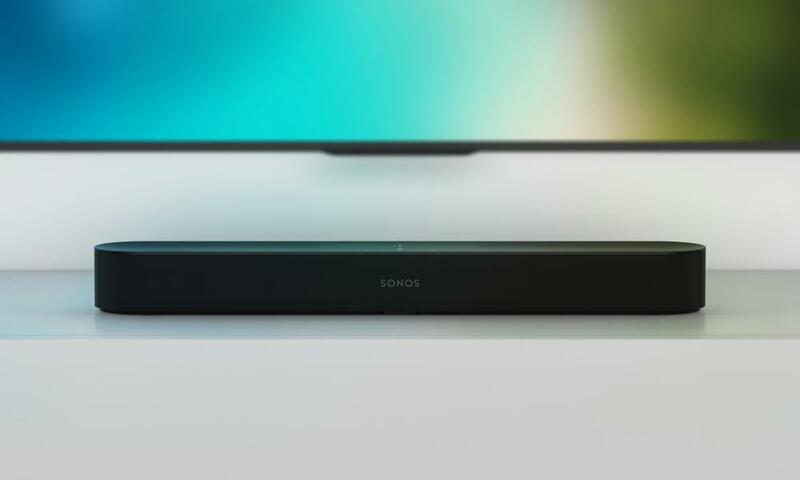 The Beam is the new, more compact and cheaper soundbar from multi-room audio specialists Sonos, which promises to be a great one-box upgrade for your TV sound, with Alexa and smart speaker functionality built in. On the surface the Beam appears to be a relatively simple product. It’s an all-in-one soundbar that connects to your TV via HDMI or optical cable and is controlled by the volume buttons on your TV’s remote. That means there’s a single cable running to your TV and one for power – no other cables leading to other speakers or a sub is required. It can’t get any more simple to use just as a dumb TV speaker. But the Beam is more than a simple soundbar, being a fully-fledged Sonos smart speaker as well. Like the Sonos One, the Beam has Amazon’s Alexa voice assistant support built in, with Google Assistant promised too at a later date. That makes the Beam a jack of all trades, capable of handling all your TV audio duties, answering your questions and commanding smart home devices via Alexa, while acting as one of the best multi-room music speakers money can buy. Setting up the Beam was simple. Plug the included HDMI cable into a port on your TV that’s labelled ARC (audio return channel), plug in the power cable and fire up the Sonos app on your iPhone or Android device. After a quick tutorial you’ll be up and running. If you have an iPhone, you then have the option of performing what Sonos calls TruPlay tuning, which involves waving your phone around while loud sounds play through the room to calibrate the speaker to best fit the space. When used as a TV speaker you simply make sure TV is selected as the audio source in the Sonos app for the Beam and then use your television as normal, controlling the volume via your normal remote. TV audio comes through very tightly controlled with excellently clear and rounded dialogue – a weakness in many TV speakers let alone compact soundbars. The Beam works as a 3.0 speaker with dedicated centre channel speakers that project straight towards you, plus left and right channel speakers projecting their sound at an angle from the ends of the bar. The stereo separation of the left and right channels is very good for such a compact soundbar, and is certainly a step up compared to TV speakers. The Beam doesn’t come with a sub, but you can add one and some rear speakers if you want (mer om det senere). As such it lacks real thundering bass, so those looking for deep rumbling from the latest blockbuster might be disappointed. But the Beam makes a surprisingly good attempt at full range sound from just one slim box, with more depth than you might expect given the size. You’re left under no illusion what’s happening in action scenes with sound effects full of attack and drama, while sport such as the World Cup has a reasonable amount of atmosphere from the crowd without drowning out the commentators with vuvuzela blasts. Two optional sound modes tweak the audio. Night mode crushes dynamic range so that loud sounds are suppressed and quiet sounds are made more audible, which helps to hear what’s going on when listening at low volumes out of courtesy to your neighbours. Dialogue enhancer further boosts dialogue, but I never found I needed it to hear what was going on, even in hushed scenes. You can also adjust the bass, treble and “loudness” of the speaker using the equaliser. Most will be pleased with the default setup, but if you want a bit more bass you can crank it up. While good for TV, the Beam comes alive when you feed it with some good music. It sounds similar to Sonos One in audio quality, just with a wider and more immersive sound stage thanks to the multiple speakers in one box. It shines with all the clarity, punch and energy you would expect from a Sonos speaker, with great separation of instruments, exciting highs, driving treble and enough bass to round out the sound. It is certainly powerful enough to fill a room and then some. Mer enn 60% was overkill in my lounge, but the sound stayed clean and crisp all the way up. The beauty of Sonos’s audio solution is that it will accept pretty much any music service, and makes them all searchable and playable from the single Sonos app, meaning you’re not tied to just one company’s music service or input source. The Alexa integration works just as well in the Beam as it does in the One – it could hear me at all times, even over very loud music, and had simple and effective control over Spotify. You can control the volume at any time, including when watching TV using Alexa, which was good. The Beam can be used on its own, but it will also play nicely with a variety of other Sonos speakers. Should you want to add more bass you can, with Sonos’s wireless sub, while rear channels can be added using a pair of any of the company’s other speakers, including the Play:1, Play:5 eller Sonos One. Likt, with other Sonos speakers you can make the Beam part of a multi-room audio group and can even send your TV audio to multiple rooms as an input source. 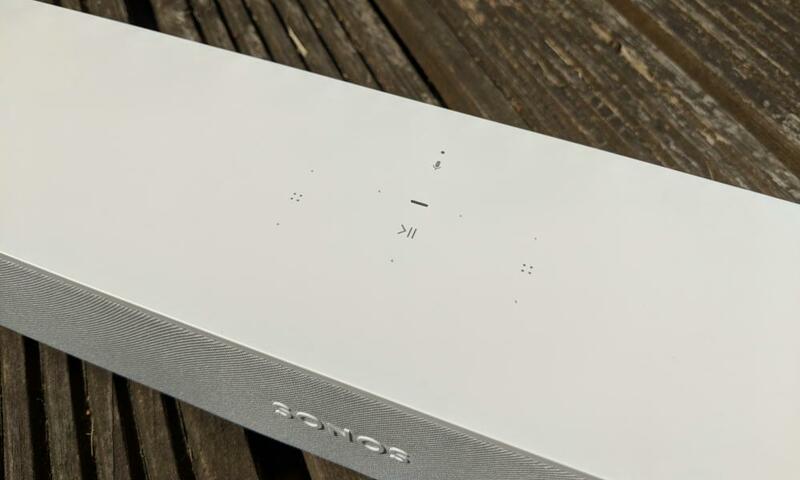 The Sonos Beam costs £ 399 and is available for pre-order in black or white, shipping on 17 Juli. 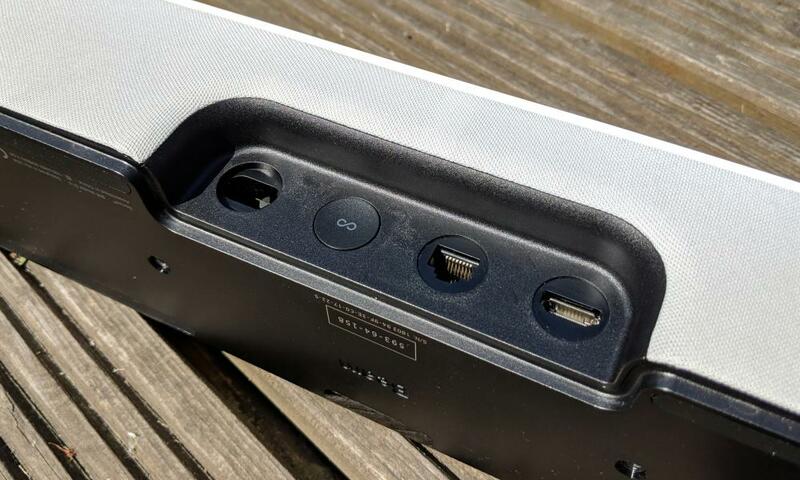 For sammenligning, the larger Sonos Playbar or Sonos Playbase both cost £699. The Sonos Sub also costs £699, en Sonos One kostnader £ 199, the Play:1 £159 or the Play:5 £ 499. Despite being £300 cheaper than Sonos’s other TV audio solutions, the Beam is expensive for just a soundbar. The thing is, det er ikke bare a soundbar. It’s one of the most compact and aesthetically pleasing soundbars that still has full-range sound without needing a sub. It’s also an excellent multi-room audio speaker, which can be combined with other wireless speakers to make a wireless 5.1 home cinema set up. And it’s a very good Alexa-powered smart speaker that sounds great. The beauty about Sonos’s audio gear is that it’ll work with the music services you already use and make using them a more enjoyable experience. 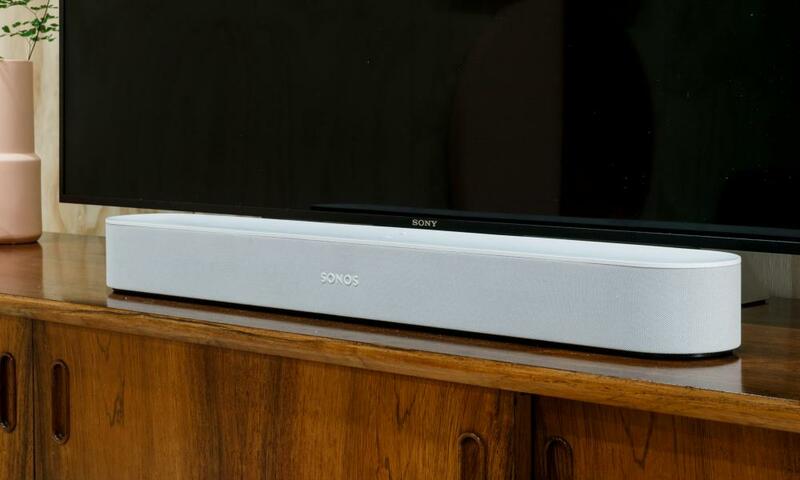 Those looking for earth-shattering explosions and heart-thumping bass will have to look elsewhere, but the Sonos Beam is a great sounding, easy-to-use compact soundbar that’s a jack-of-all-trades and very easy to live with, particularly in smaller rooms or apartments. LG G Flex Hands-On gjennomgang!